The smell and sizzle of ghee (or butter) hitting the frying pan is sure to wake the deepest of sleepers. 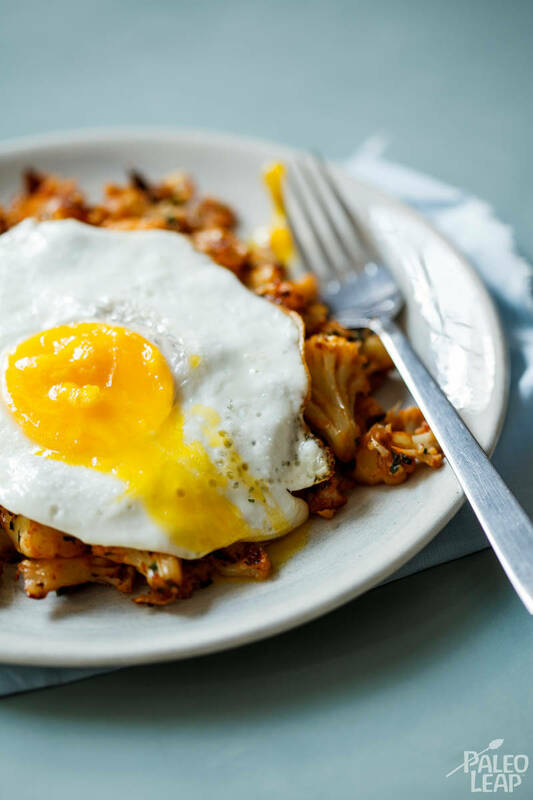 This cauliflower hash with eggs is a great weekend brunch idea, or a satisfying weekday breakfast if you have a few extra minutes in the morning. Garlic, onions and aromatic spices bring out the savory flavors of this one-pan dish. Are you making your own bone broth? If so, pour in the broth and let the cauliflower soak up the flavor of the stock and spices. If not, you can buy a quality chicken stock at your health food store. The texture and body of the cauliflower will have you thinking you’re gobbling up a plate of potato hash browns! Save yourself a few dishes and fry up eggs in the same frying pan. Serve them atop the bed of hash. Feeling extra hungry? Cook up chorizo or Italian sausage and serve on the side. Want to see this recipe in action? Keep scrolling for a short and sweet video of this recipe! Melt the butter or ghee in a large frying pan and add the onion and garlic. Sauté until soft and fragrant then add the spices. Stir to coat the onion in the spices and add the cauliflower. Pour in the chicken stock and cook for 10-15 minutes until the stock has been absorbed and the cauliflower is cooked. Season to taste and add the parsley. Stir well. Serve the cauliflower hash topped with a egg cooked to your preference.